Storage facility options range widely, depending on a variety of factors. It can be difficult to navigate! Depending on what, when, where and why you need storage will help decide the best solution! I am moving and my new home/apartment is not ready! I need storage for a short term period. Moving to a new location for a temporary period! I need storage for the duration. I have a remodel going on, and I need storage during the construction! I need storage on a long term basis. There are also several types of storage, and pros and cons to each! Storing a car or cases of wine will require different storage than general household items or clothing! The types of items you plan to store should absolutely factor into your decision. How you plan to get items from Point A to Point B as well as the labor aspect, will likely also factor into your decision! There is no right or wrong answer, but there certainly is a right or wrong choice for your unique needs! 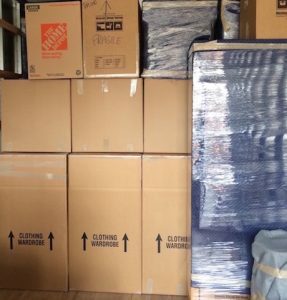 Full service storage like we offer at Moving Ahead Services is a convenient option for every storage scenario. This is an easy, safe and affordable way to get long or short term storage. Our experts can handle everything from packing, loading and storing to delivery – All for an affordable rate with ZERO hidden fees. Our indoor storage facility features 24/7 security monitoring, climate control and easy access for you throughout your storage period. Storage Facility – U Store / Units can be great as well, but often fill up quickly and come with a lengthy wait list, especially for climate control. Ask about any additional fees, if you can extend past your agreement and how general access works! We work with several reputable storage facility owners in Ohio, just ask us for a referral! On site mobile storage Can be convenient for remodeling and very short term projects, but we don’t largely recommend it and many of our clients haven’t enjoyed it! Storage lockers can be difficult to load or get access to once loaded. It is also not a great fit for anything that requires climate control! Businesses will often seek a storage facility for a variety of reasons – Ranging from short term storage needs, to long term strategic offsite storage contracts. Moving Ahead Services is a trusted commercial storage partner for businesses across Ohio! Call us today to discuss your business storage needs!